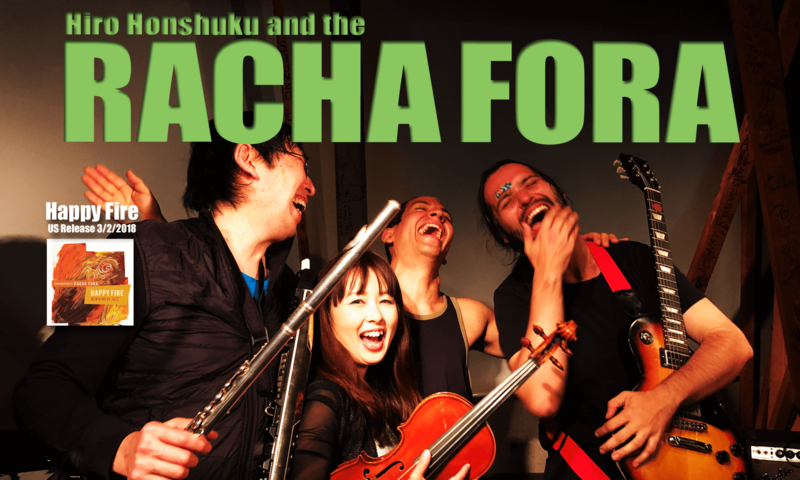 Racha Fora, which had been focused on Brazilian influences, sifted to more jazz oriented this year. 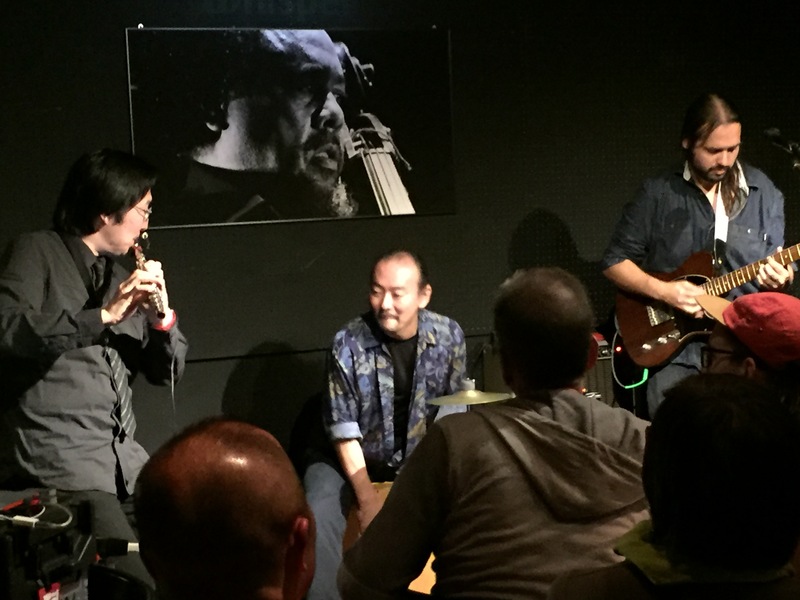 With a trio format consists with flute, guitar and percussion, they challenged to create more freedom. On their first Japan Tour in 2013, they had Ryo Noritake at the drum kit. The following year the drums was replaced with pandeiro played by a Brazilian, Francis Silva who lives in Japan and Keijiro Nagaoka. Last year Nagaoka filled the pandeiro seat by himself. 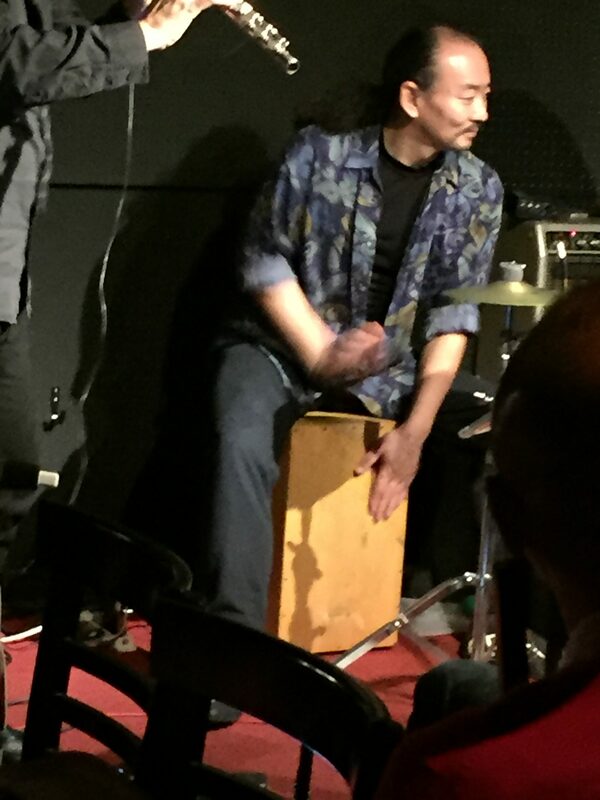 This year, Nagaoka switched from pandeiro to cajon. The leader of Racha Fora, Honshuku deeply cares about pulse and beat as he always focuses on his articles in this magazine’s popular section, Song Analysis Series that he has been contributing. He wants to play with a exciting grooves, and he demands it from the band. 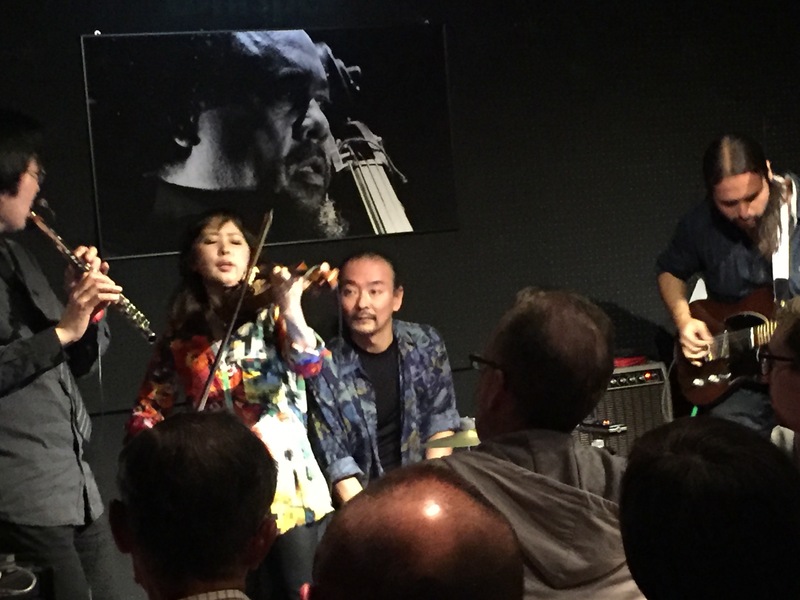 When he plays good because of the grooves the band provides, the band becomes more grooving. 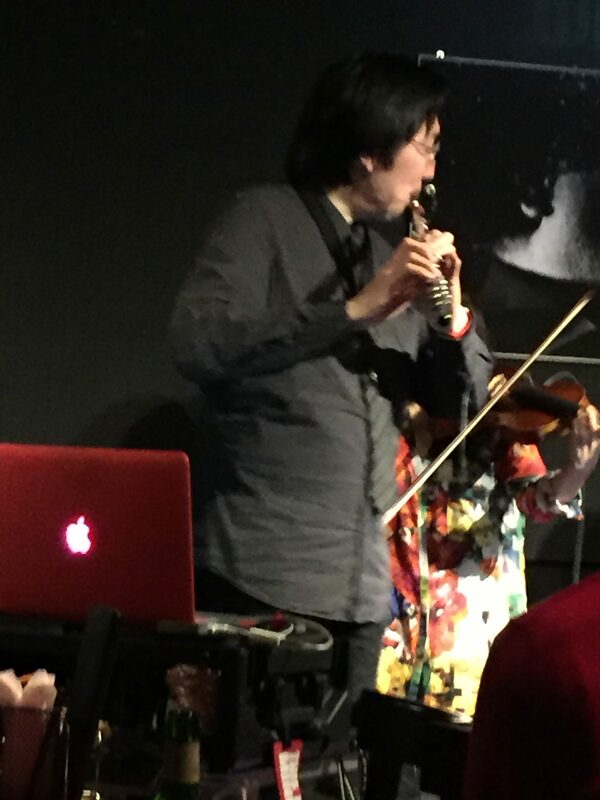 This synergetic exchanges excites audience, which drives the band further. The energy starts to circulates between the band and the audience. 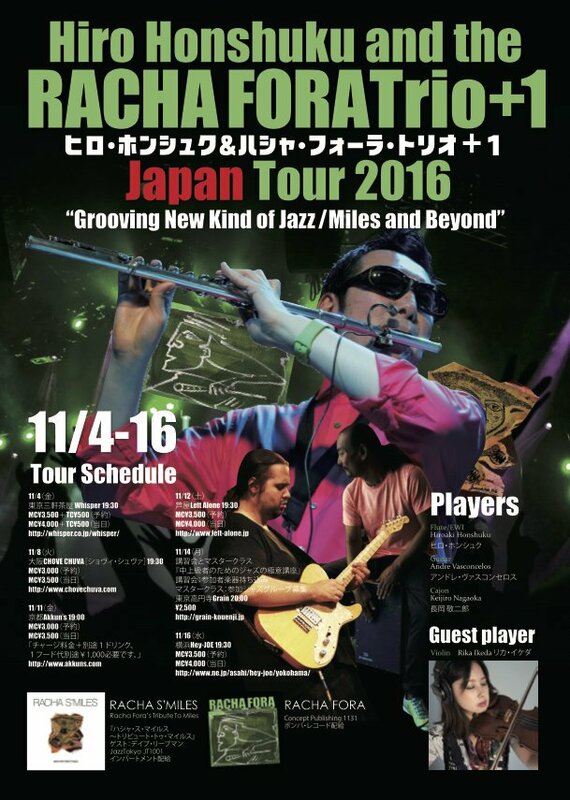 This tour was mainly scheduled with jazz clubs this time. 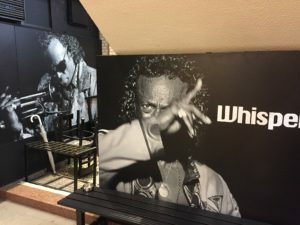 I went to see their opening night at one of The Church of Miles’, Whisper. 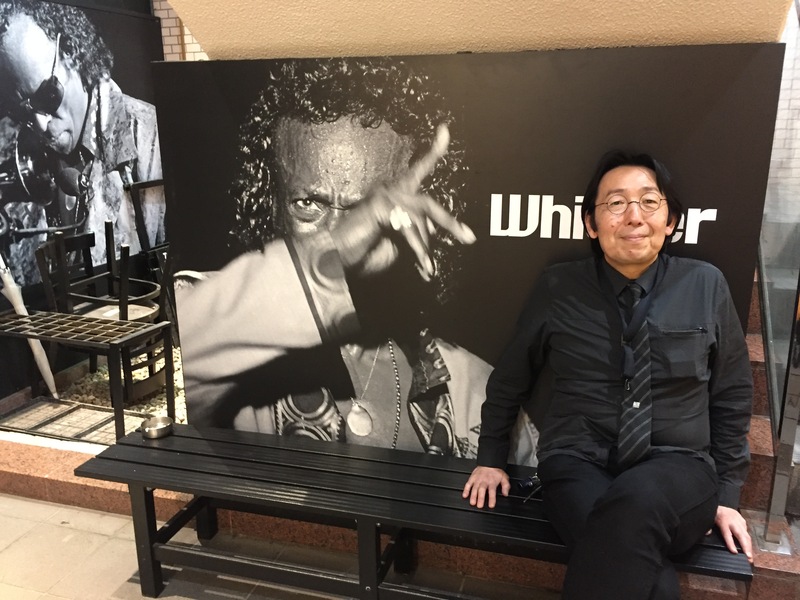 At the bottom of the stares, you are greeted by 2 huge panels of Miles’ photos where I saw Honshuku was ecstatically enjoying Miles’ aura. 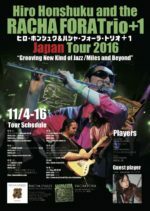 The owner of the club is a well known jazz photographer, Shigeru Uchiyama, who is famous for his popular works of Miles and Jaco. There are a few other well known jazz photographers who are also owners of jazz clubs, such as Hozumi Nakahira and Seiichi Sugita who is also known as one of the contributors for our magazine. This club, Whisper is designed with black and red theme, which reminds me a jazz cafe Village Gate in Sinjuku, Tokyo back in 60’s. It is very nostalgic for someone like me who spent all night long at jazz cafes in 60’s and 70’s. Whisper’s November theme was bassist. A huge Charles Mingus picture is giving a scarily look at the back wall of the stage. To tell you the truth, it was the first time for me to see cajon live. The word ‘cajon’ in Spanish means drawer or box, and this instrument is originated in Peru. As the name suggests, it’s a box shape. A performer hits this percussion instrument with his/her hands. However, it is not as simple as it sounds. Ones heel kicks the box to produce bass drum sound or heel is used to mute the sound. It can replace drummer. 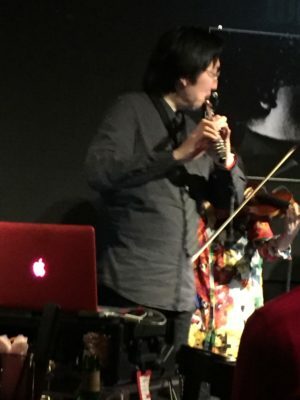 Nagaoka was mainly using hands but doing an amazing job contributing musically to the band by responsive comping and solo trading. Another one to be mentioned is Andre Vasconcelos on guitar. With his solos, grooves, and covering the low registor where bass is missing, he showed off his rich talents as the top graduate from Berklee College of Music. 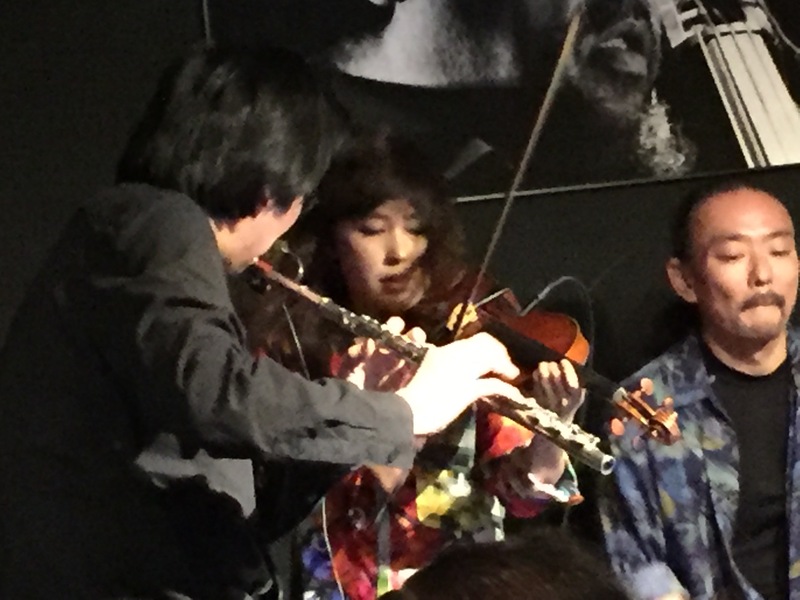 They opened the night as a trio, playing jazz focused selections such as Miles’ repertoires. When then Rika Ikeda joined the stage, they switched to the Racha Fora sound we are familiar with. 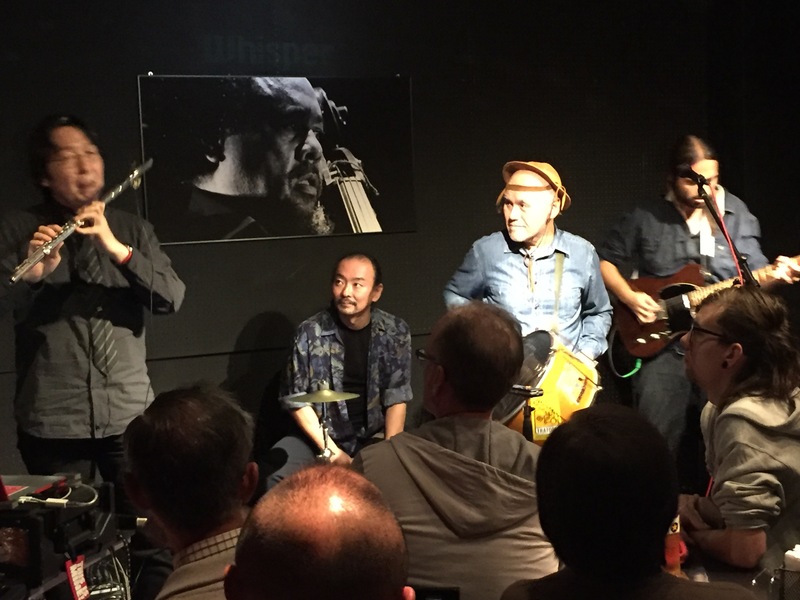 By now, the familiar Honshuku’s original compositions with native Brazilian grooves sound as if a part of Miles’ music. When they started E.S.P. 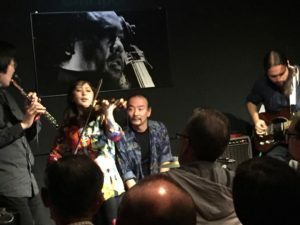 with Honshuku’s effects-rich EWI (Wind Synth) and Ikeda’s burning solo with spontaneously responding band grooves, the excitement of the Tokyo Jazz Festival 2015 returned to the audience. Racha Fora is keep evolving. Can’t wait what they will bring us this year.